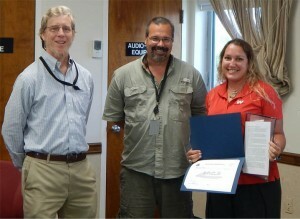 The National Oceanic and Atmospheric Administration (NOAA) selected IAP Fisheries Scientist Kelli O’Donnell as the 2015 National Marine Fisheries Service Team Member of the Year. Team Member of the Year Awards are presented to non-NOAA Federal employees for their contributions to the Nation towards the stewardship of living marine resources as recognized by their NOAA Fisheries peers. An IAP contracted field/port agent sampler in Key West since 2012, O’Donnell independently intercepts and collects finfish and invertebrate samples/data from commercial fishermen/vessels and headboat vessels. She provides assistance to dealers with state and federal reporting requirements for fisheries, as well as with compliance issues, fish identification, and entering data in the Florida Trip Ticket System. Balchowsky notes that O’Donnell has shown great initiative in routinely requesting lists of dealers who should be providing reports in her area prior to fishing seasons. She also has communicated the names of dealers that are processing seafood who are not on NOAA’s radar. “Kelli O’Donnell is dogmatic in following up on requests we have made for clarifications in dealer reports and always gets back to our group in an impressively short period of time,” says Balchowsky. One example of how O’Donnell’s initiative and persistence have eliminated problems and incomplete data is with regard to the Spiny Lobster fishery landings which were being incorrectly converted due to incomplete dealer reports resulting in landings elevated by over 2 million pounds. O’Donnell’s persistence in education and customer service helped resolve incorrect reporting for 95% of these landings. 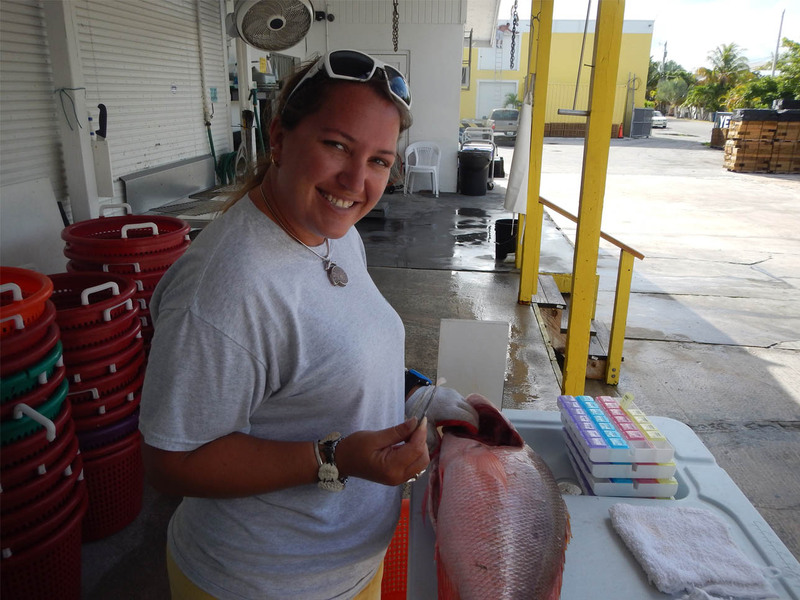 Kelli O’Donnell, holding a Mutton Snapper Otolith Unaddressed, this could have forced an early closure resulting in all dealers and fishermen in this fishery to stop their processes. A Marine Biology graduate of Florida Institute of Technology, O’Donnell is currently enrolled in University of Florida’s distance student Master’s program in Fisheries and Aquatic Sciences. She also is an instructor for University of Florida’s Master Naturalist Program in which she instructs students on the protection and conservation of Florida’s flora and fauna and ways they can protect and conserve it. “My class and I were able to rescue a green sea turtle with fibropapilloma tumors covering its eyes that is now recovering at the Turtle Hospital in Marathon, FL.,” she reported. O’Donnell volunteers with the Florida Fish and Wildlife Conservation Commission assisting with sea turtle nesting and shorebird rooftop nesting success surveys. She is a board member of the Save-A-Turtle non-profit in the Florida Keys, the South Florida Association of Environmental Professionals, and the Monroe County Extension Marine Advisory Board. She volunteers with Mote Marine lab in their In-situ Coral Nursery where she designed a field-oriented research coral growth monitoring project for her Masters work. She also was recently chosen to participate in an educator/outreach workshop on the Flower Garden Banks National Marine Sanctuary and its fish and coral inhabitants.